Their fate... Your hands... Roll the DIE. 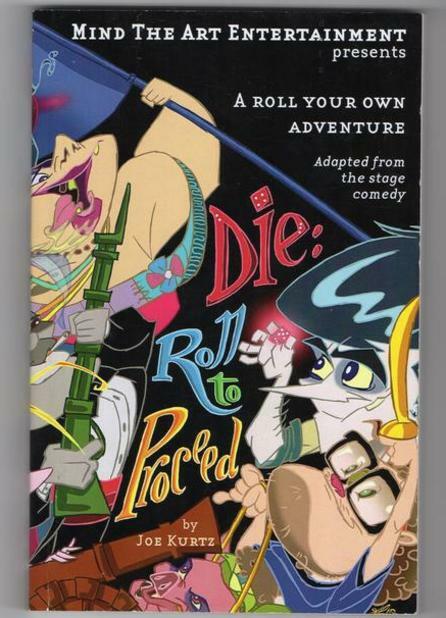 "I have to say that “DIE: Roll to Proceed” really was a play to die for...."
"A Choose Your Own (Hilarious) Adventure.... DIE: Roll to Proceed is the show to see in NYC!" "Gives new meaning to 'Roll' play... Bring your ID and leave your inhibitions at home..."
"The thrill of live theatre is that anything can happen on a given night, and that concept is pushed to the extreme by Die: Roll to Proceed"
Die: Roll to Proceed is now also an original Roll your own Adventure Novel! Imagine, if you will, a world unencumbered by the stress of decision-making; a world where you never have to wonder if you made the ‘right decision.’ In this roll your own adventure book, two roommates make this a reality by letting the roll of a DIE decide for them. But is life really carefree when the responsibility is left up to chance? You are in control of all the hilarious misadventures of this unlikely duo. The DIE is in your hands, so hold on tight for a different journey every time. Choose your own adventure novel!